She landed in Normandy in August 1944, where she was assigned to the 29th Field Hospital. During the Battle of Brest, she joined surgical team, in very dangerous conditions. After the Liberation of Brest, her surgical team moved to Lison and Paris, then to Liège in Belgium where she continued to support actively the Allies during the Battle of the Bulge She continued to take care of the soldiers even after the surrounding of Germany. For her accomplishments during World War II, Ms. Kirkendall has been awarded the European African Middle Eastern Campaign Ribbon with Three Battle Stars and the World War II Victory Medal. 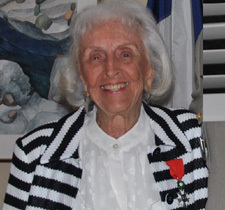 On February 15, 2017, she received the Legion of Honor, the highest award of the French Republic, a well-deserved medal for her incommensurable contribution during WWII. General Thierry Ducret has been Chief of the French Detachment to USCENTCOM since the 1st August 2016. His former assignment was Chief of operations to the Allied Rapid Reaction Corps in England.